Clackmannanshire also called Clackmannan is a council area and a historic county in Scotland. The county gains its name from three different languages. The word Calch is Scottish Gaelic and means stone. The word Mannan stems from the Brythonic name given to the Iron Age tribe of Manaw and the English word Shire. Clackmannanshire is the smallest county in Britain and is fondly called the “Wee County”. Sitting between the counties of Perthshire and Stirlingshire, Clackmannanshire is mostly made up of farmland and small settlements. The old county town is Clackmannan gets its name from a stone linked to the deity Manau. The town villages of Alva, Tillicoultry and Dollar are set against the backdrop of the towering Ochil Hills and contain castles, mills and beautiful parks. The Ochils slices through many deep glens and promises a breath-taking walk. At the opposite end of the range, you’ll come upon the wooded valley known as Dollar Glen. The Hillfoots revolutionised weaving, pushing it from a cottage industry to the industrial field and at one time the location was the second most prominent centre for weaving in Scotland. ”. Today, the county’s well known for its thriving art scene and holds an impressive collection of artwork by international artists. When you’re not taking in the sites, you can head over to Sterling Mills Outlet Shopping Village, rest at one of the many campsites, enjoy a pint at one of many cosy pubs or pamper yourself at a luxury spa! ”. I am Ruby1, hire me today! Get on the road with Ruby, a 1989 original Vanagon - Westfalia import. 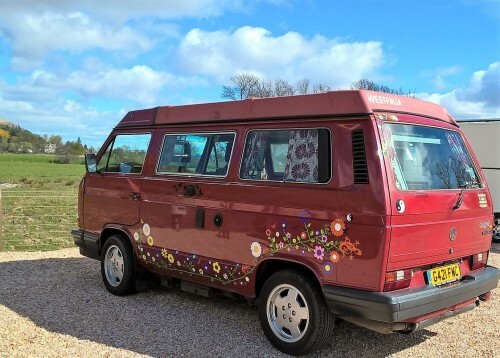 Ruby sleeps 4 people and have plenty to offer for a relaxing vintage road trip. has a central heating for the cabin for comfy night, a portable shower and plenty more. No vans have been added..